Answer this multiple choice question: What is the worst problem with M-STEP, the Common Core-aligned standardized assessment taken by tens of thousands of Michigan students in grades 3-8 and 11 each spring? The testing time for students drags on torturously for hours at a time over too many days. The weeks-long testing ties up technology that could be used for education purposes. The test holds no meaning or value for students, who have no accountability for their performance and will never check answers or see results beyond a number score. Even adults can’t figure out the correct answers to many questions. A standardized test does not accurately measure creativity, problem solving, analytical skills, or much of anything that parents, educators, and societies value in human beings. Teachers get little to no useful data back from the test; instead, the scores are used to bludgeon educators and public education as failures. Short-sighted administrators force teachers and children to undertake mind-numbing test prep in a futile attempt to raise test scores that results in students hating school. The test measures poverty really well – less so the wonder of teaching and learning. Now, please choose your answer… Excuse me? I can’t hear when everyone shouts…Thank you for raising your hand, Charlie… Yes, choose ONE answer… Question, Billy?… Mm hm. I know it’s hard to pick, but life is hard, right? So this is preparing you for life. Just do your best. Yes, Sally? … You’re correct; the question IS confusing, but it’s asking what is the WORST problem, not the biggest…Well, I agree “worst” can mean different things to different people, but so can “biggest.” Ha ha. Am I right? Yeah, I got you there. So why don’t you figure out what you think the test writers want you to answer, and go with that?… You’re welcome. Is everyone about fin—OK, I’m waiting, Janie. But really, my dear, follow your gut. It usually won’t lead you astray. You can overthink, you know. This answer actually is quite clear. The answer is D: Even adults can’t figure out the correct answers to many questions. Because the fact is if you ask a bunch of educated adults to take a fifth-grade Language Arts M-STEP practice test with no answer key, you’re bound to see a fight over who is right on many questions, and that’s pretty crazy if you stop and think. I know, because I did it and saw it. I asked several of my MEA colleagues to sit in a room, tackle some reading passages and multiple choice questions individually, and then discuss answers. As a former English and language arts teacher, I had created an answer key myself since it wasn’t provided by the state – although I was not certain about all of my answer choices. The results were illuminating to my participants – a secretary, MEA’s director of Public Affairs, one of our lobbyists, and a communications specialist. On the other hand, I was not surprised at all. Teachers know these tests are poorly written and subjective. The structure and organization of some reading passages would not pass muster in a high school composition class. Questions are often either ambiguous, narrowly focused on unimportant details, or difficult to comprehend. Answers can be open to interpretation. I found grammatical errors even in the small official test sample I borrowed online, such as this use of an adverb instead of an adjective in an answer option: “James felt badly about his grandmother ignoring his questions.” Call me a stickler, but the adverb “badly” modifies the verb “felt,” while the adjective “bad” would have described James’ inner state. Which is it? My idea for proctoring the exam sprang from the blood pressure spike I experience every time someone talks in generalities about schools, or public education writ large, based on “scores.” The way we bandy about school “rankings” implies acceptance that the tests are a valid and meaningful tool for judging school and student performance on a grand scale. How better to test that blind acceptance than to challenge successful adults with a fifth-grade assessment? We started by reading a non-fiction piece written in the style of fiction, first published in 1905, about the inventor of steam locomotives: “James Watt and the Teakettle.” Of six questions about the selection, my panel of test takers disagreed on answers to three of them. The first argument arose over a question about how the first paragraph of the reading selection affected “the plot.” The directions said to choose two answers from six choices. We all agreed on one, but three panelists selected three different choices as the second answer. In one case only four choices were given, and we picked three different answers. Then we explained and argued and maybe even raised our voices – it got animated a couple of times – and no one changed answers, though we could see the legitimacy of each other’s reasoning. Yet bubbling the “correct” response is what educators are increasingly pressured to teach children how to do, with ever bigger stakes attached – including job security. We pay lip service to valuing critical thinking, reasoning, expression, creativity – but our blind adherence to standardized testing belies those ideals. A society that truly values higher-order skills and attributes does not burden its educational system with high-stakes “accountability” that measures less important aptitudes – the pursuit of which dampens rather than awakens students’ curiosity and independence. I would add to Singer’s metaphor: “…on a glitchy TV screen that blinks on and off every few seconds.” And I’m just referencing the confusing nature of the test—never mind the technology issues that teachers complain about. It’s hard to demonstrate skills in a vacuum. That confusion caused my panel of fifth-grade test testers to get irritated near the end of my experiment. We had read a poorly written selection, “New Homes for Hermit Crabs,” and we were disagreeing on answers to more than half of the questions. A two-part question was particularly aggravating, because if we couldn’t agree on Part A, we were doomed to miss Part B. Do I pick the “point of view” in the first half of this mish-mash of a paragraph, or do I go with the completely different idea discussed in the second half? Then what do I do in Part B – “Which sentence from the text best supports your answer in part A” –when none or all of the answer choices make sense? I feel the need to remind you – this is a fifth-grade test. And also to point out – To this day I still am not sure what the “correct” answers are. I appreciate my MEA colleagues for accepting the Are You Smarter Than a Fifth Grader challenge. They got to experience a tiny fraction of a sliver of the confusion and frustration youngsters feel taking these boring and pointless tests for hours at a time. And they helped illustrate some truths that make educators want to scream and rail and bang their heads against walls – and leave the profession. 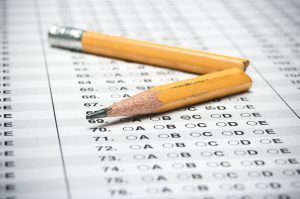 The standardized testing industry is hauling in huge profits as U.S. taxpayers shell out billions of dollars for poorly designed assessments that hamstring educators and paint a false picture of public education. We use results from questionable tests to downgrade teachers in their evaluations and threaten communities with the loss of their neighborhood schools. We cut school funding and issue top-down edicts from politicians and tighten the screws on educators to raise scores above all else. And we hope beyond any reason that good results will come from all this bad. The answer to this problem is clear and simple – STOP THE TESTING MADNESS. But in our current political landscape, that’s not even one of the multiple choice options. My favorite is the student who designed a Christmas tree out of her answers on her bubble sheet and proudly showed me as I picked up her answer key. It is frustrating for students and a useless waste of time. Glad to be retired and out of the nonsensical rat race education has become. Loved the years that I was allowed to be a teacher! Why are we bothering to do this for little to no value and a was of time and taxpayers dollars??? Seems stupid to me! This year the district is adding even more testing to the Lower Elementary years. Kindergarten is required to take computer tests!!! Who could ever think that this is age-level appropriate? And then to be put on a matrix of effectiveness for teachers based upon a test that clearly at all levels of grades, isn’t even written correctly? I keep thinking that the pendulum will swing back to age of appropriate activities and learning enviroments for our children but sadly more and more tests come rolling out. It comes down to money, not what should be valued in a young child’s life.